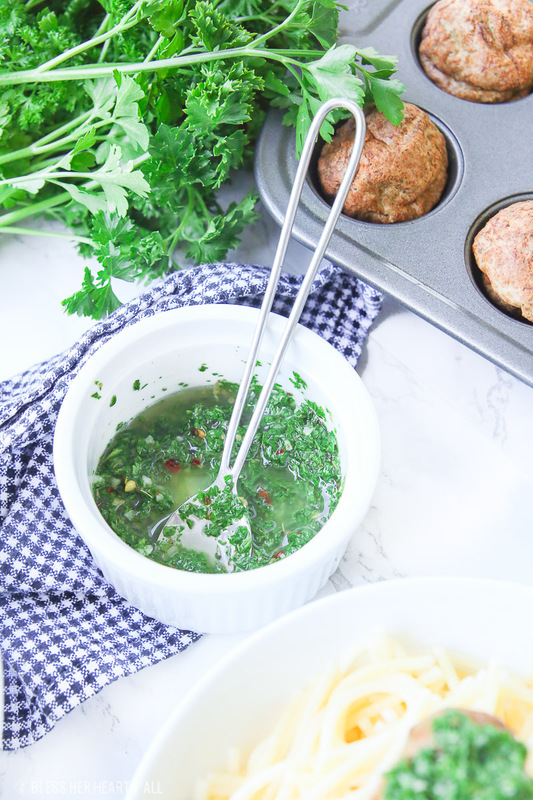 Chimichurri meatballs bake juicy bites of fresh beef and cilantro and then drizzle them with an easy homemade chimichurri sauce! This quick appetizer recipe is low carb, paleo, and gluten free! 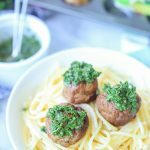 Chimichurri meatballs are a great way to use some of those fresh herbs coming up from your spring garden. 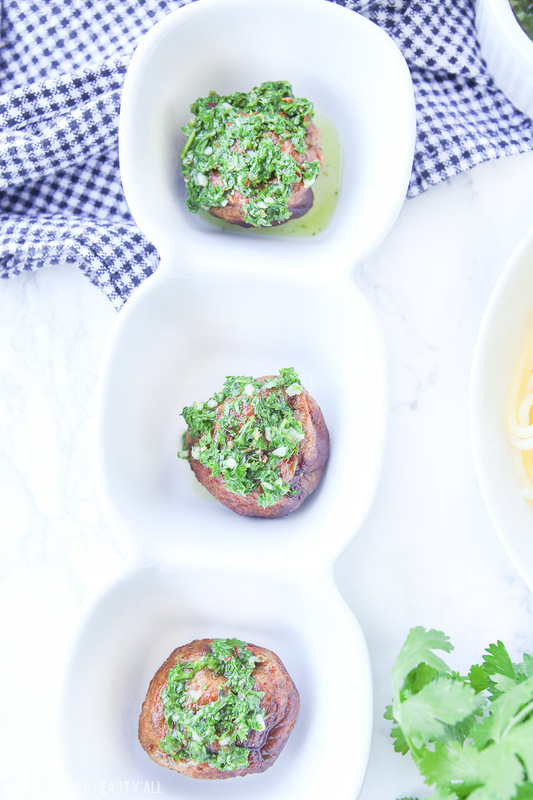 Fresh cilantro is baked into each juicy meatball. Then to top things off, a homemade chimichurri sauce using fresh parsley, garlic, olive oil, and a pinch of red pepper flakes is drizzled over the top of each meatball. Not only do they look stunning sitting on their own on an appetizer platter at any spring party, but they taste amazing over top pasta of any kind. 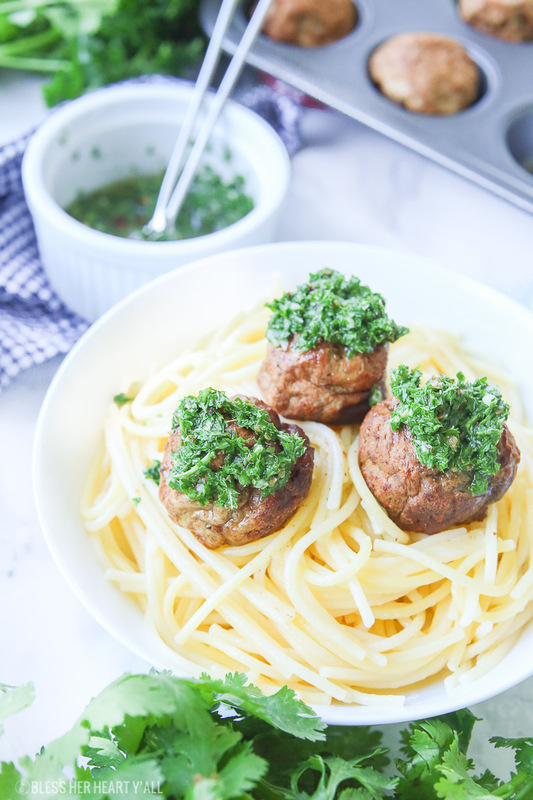 These chimichurri meatballs have so many options and look so fancy. Even their cleanup is a breeze. You’ll need to clean the mixing bowl and the mini muffin tin that the recipe uses and maybe tidy up the kitchen a bit but that is it. 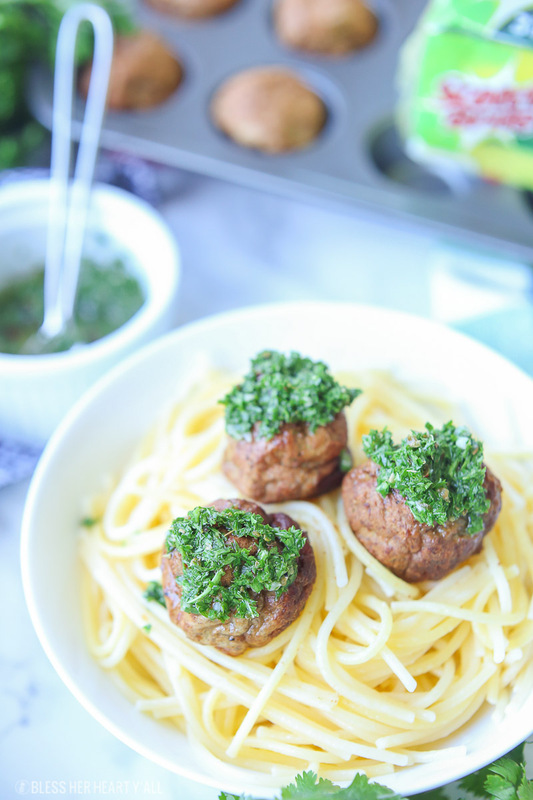 That means more time to entertain your guests with these fantastic chimichurri meatballs! 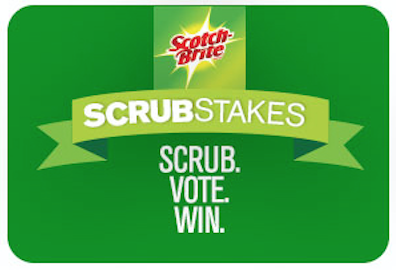 I’ve been using Scotch-Brite® sponges from Kroger to clean up my kitchen messes for years. These days I’ve been using Scotch-Brite® Non-Scratch Scrub Sponges (they’re the blue sponges). They safely clean non-stick cookware as well as counter tops, cook tops, tubs, shower tile, and windows without scratching. 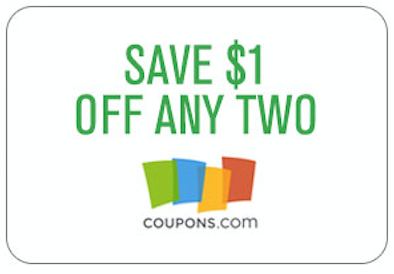 So let me recommend using these sponges to clean up the nooks and crannies of the mini muffin tin. I also use the Scotch-Brite® Heavy Duty Scrub Sponge (the green sponges) for pots, pans, and oven racks to remove tough, baked-on messes. Between the two sponges I can get my entire kitchen cleaned. Preheat your oven to 400*F. Combine all meatball ingredients in a medium mixing bowl and then thoroughly mix together with your hands. 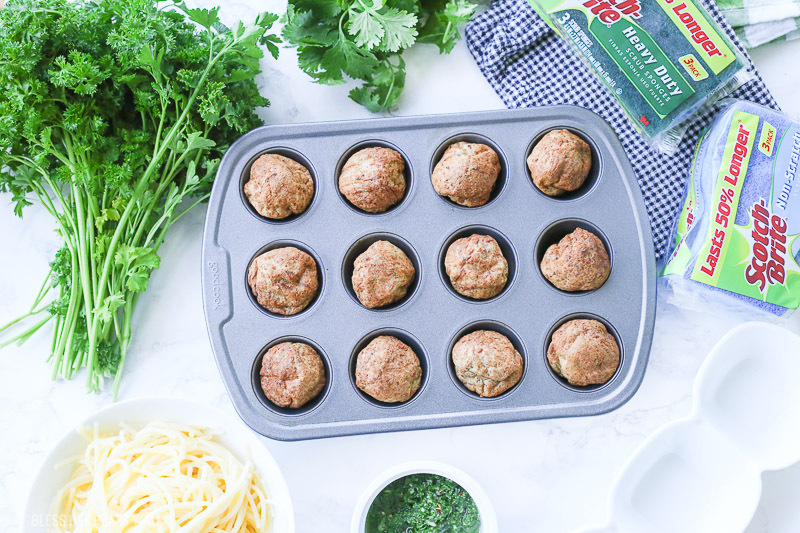 Roll into 1-1.5" inch balls and place each meatball in a mini muffin tin. Bake for 10 minutes, take out of the oven, flip over, and bake in the oven for an additional 5 minutes or until thoroughly cooked and the outsides are nicely browned. 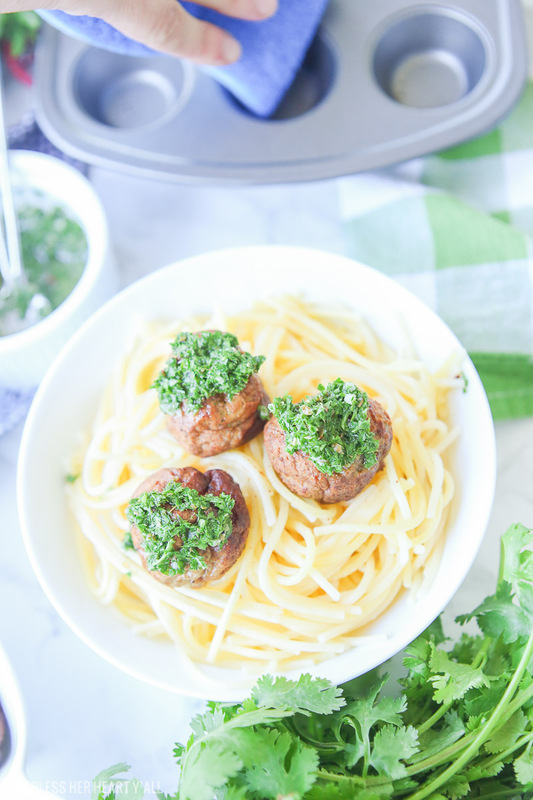 While the meatballs are baking, make the chimichurri sauce by combining all the chimichurri sauce ingredients together in the bottom of a food processor and pulse until finely chopped or until the desired consistency is reached. Set aside. 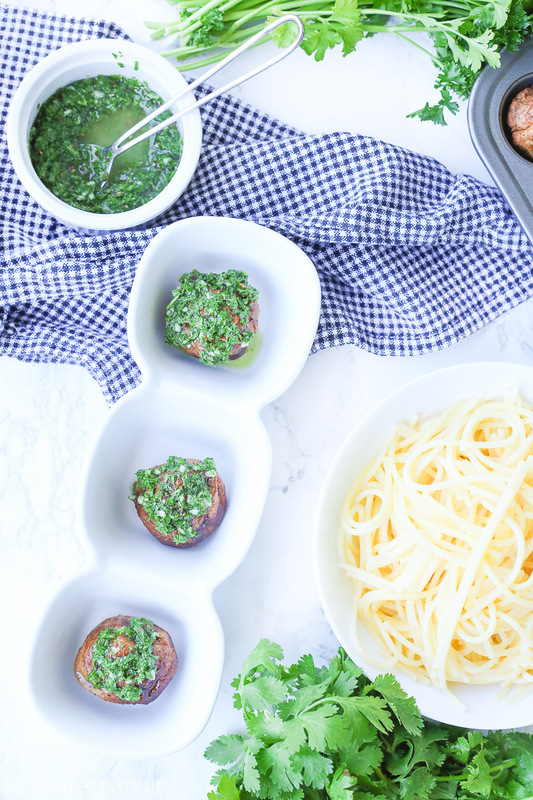 Once the meatballs have cooled on the towel, transfer to a serving dish, drizzle with chimichurri sauce, and enjoy! Be careful when handling the hot meatballs. I don’t want anyone to burn themselves and secondly, the meatballs are somewhat more fragile until they have cooled a bit. You can easily mix up your chimichurri sauce and turn it into a cilantro chimichurri sauce by substituting 1/2 cup of parsley with 1/2 cup of cilantro. If you would like the paleo version of this meatball recipe then swap the wine vinegar for apple cider vinegar. The red pepper flakes add a touch of flavor and no heat to the recipe but if you are nervous about then still, remove them from the recipe and add a pinch of black pepper in it’s place. The meatballs can be stored in an airtight container in the fridge for up to 3 days. 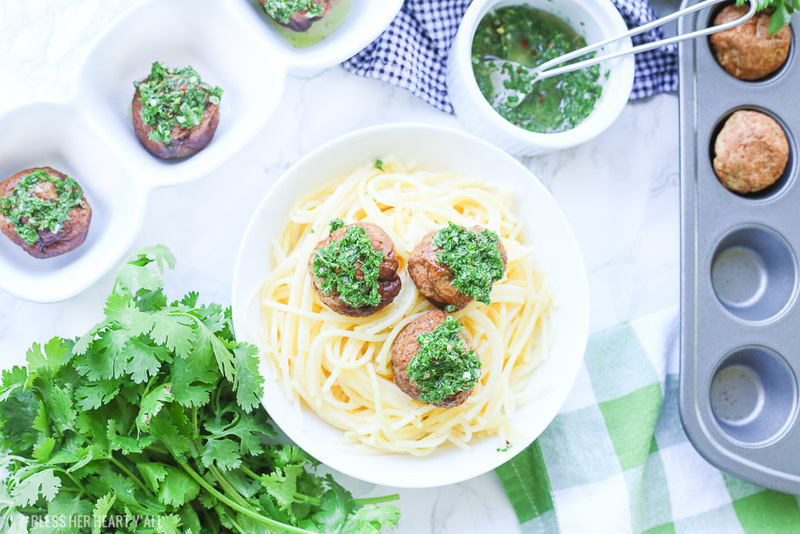 On top of making these delicious chimichurri meatballs and cleaning up your kitchen with ease, now you can also enter the Scrubstakes promotion and support #TeamSponge for a chance to win a $20,000 kitchen makeover. Imagine the entertaining you could do in a newly remodeled kitchen! I partnered with Scotch Brite, a brand I personally recommend to friends and family for this post. Thank you for continuing to support me, BHHY, and the brands that help make this site possible.